Sachse is quickly becoming a hot spot for DFW families who want more space on larger lots and often small acreage homes. Sachse homes range from gorgeous custom build homes with incredible views to wonderful entry-level homes in attractive and safe neighborhoods. 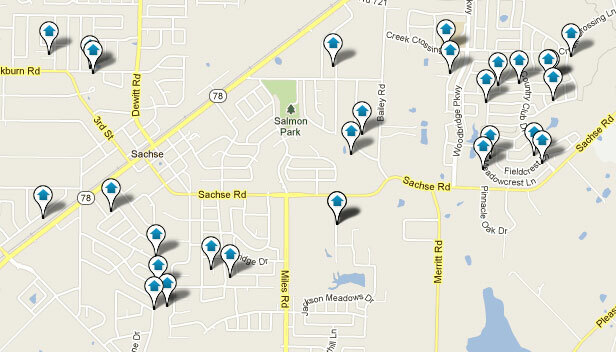 Sachse real estate is considered to be a bit of "a steal" right now. Many are buying acre plus sized lots and remodeling well built but smaller homes or building new homes on these beautiful pieces of land. There are however still wonderful established neighborhoods of traditional sized homes and lots and phenomenal schools nearby. While Sachse used to be "out on the edge of town," it is now a combination of a wonderful family-oriented community with room to grow and a location just minutes from world-class shopping, downtown Dallas, major highways, lakes, farms, ranches and more. Richardson, Plano, Garland, Firewheel, Murphy and Wylie all within minutes, Sachse offers everything from country living to high-end retail very, very close. Using our websites innovative home search tool will provide you with all the newest information regarding Sachse homes for sale. Sachse is in Collin and Dallas Counties. Northeast of Dallas, Sachse is approximately 1 mile north off the President George Bush Turnpike (Texas State Highway 190) and Firewheel Town Center. Sachse is home to the 18-hole Woodbridge Golf Course, home of the Northern Texas Chapter of the PGA of America. Sachse residents who live in Dallas County are zoned to schools in Garland Independent School District (GISD). Sachse residents who live in Collin County are zoned to school in Wylie Independent School District (WISD). There is currently a major historical revivalist movement, intending to restore several old buildings as well as create a local history museum. Contact an experienced Sachse REALTOR today at The Todd Tramonte Home Selling Team to begin your search for a great Sachse home. Thinking about Relocating/Moving to Sachse, TX? Listing courtesy of American Realty Services. Courtesy of NewGen Properties LLC. Listing courtesy of NewGen Properties LLC.. Listing courtesy of Pecan Real Estate.